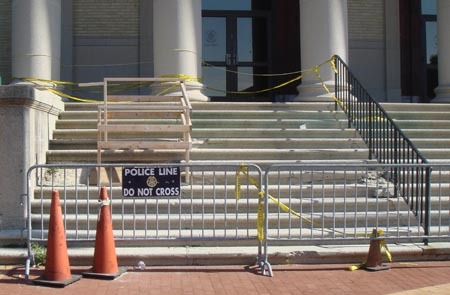 Last week at the Framingham Downtown Renaissance meeting, it was mentioned that the steps in front of the Memorial building are finally going to be fixed. I asked if there was a time table for when the repair will be completed (or even started) and the didn’t have specifics but was told “very soon”. You might remember I posted over two years ago that town meeting approved funds to fix the steps and that was when they were just using cones. We’ve seen the caution cones “evolve” into a small structure yellow tape and gate around it. This looks terrible, makes a bad impression on our town and has been frustrating to look at for so many years (the steps were in crumbling condition for a longtime before my previous post). So I’m happy to say I was told confidently they will be fixed “very soon” and that the hold up was that they found it the damage was more than the exterior step and have to fix the strucural elements underneath (that’s what I was told). I still think it’s an insane amount of time to get these stairs fixed but I’m hopefull it’s really going to happen now! The symbolism of this disrepair in Framingham is huge. The Town can’t even get its window dressings right, even for the seat of Government. Come on Framingham, have some pride; at least put your best foot forward. I think that it is great that the steps are getting fixed! Things take time, but hopefully they will come out great. Main Street Bridge Structural Steel is arriving July 28, 2009 and it will be erected at that time. Decking will be received Aug 25, 2009 and will be installed at that time. Completion by Thanksgiving. I received this update today from Mass Highway if anyone’s interested! I cannot wait for this bridge to reopen! Cannot come soon enough, I broke my hearing aid after tripping on these stairs, and reimbursement was a royal pain. Good grief. my son (3) and I were just looking at the work ongoing on the stairs as we went to the library. so far, looks like its coming on apace.